Newport Windows can help you find the right style and materials for any/all of the doors on your property. Our doors don’t just serve a practical purpose; they are designed to look good and to enhance the external appearance of your home. You may be looking to replace old and worn out doors that no longer insulate your home properly or that do not give you the best security options. You may simply be looking to update the design/style of your external doors. Rest assured, Newport Windows will have a solution to suit your needs, exactly. We offer a full range of doors to suit all tastes and property types. Our designs can slot seamlessly into new homes or into older properties. All of our doors are constructed to the highest quality standards and we can offer you a broad range of locking and security options to market-leading standards. Window-Rite can help you find a cost effective solution here, whether you are simply looking for a new front door or whether you want to replace your doors at the same time that you use our windows or conservatory services. Once we have helped you choose the design to suit your home our skilled installers can have your new door(s) in place quickly and efficiently. For more information on our door services or to arrange a free, no obligation quote, please contact us. 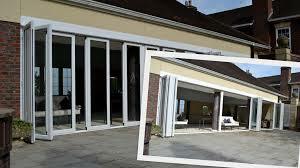 If you are looking for Bifolding Doors in Newport or Bifolding Doors in Cwmbran and surrounding areas LOOK no further. We only supply the new style Flowing Sash Folding Doors. There are many advantages for installing our doors, lighter, easier to handle, numerous opening and ventilation positions and no maximum sizes. To view samples of recent doors installed in the local area please click here.